You don’t have to be in your 70s to be moved by the sight of a Norton Manx. 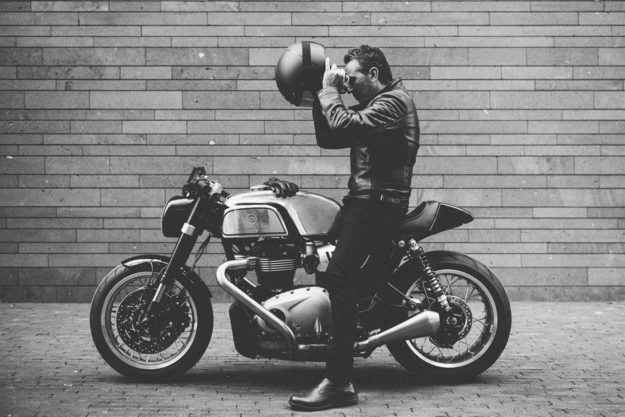 It’s one of the few motorcycles that can truly be called iconic, and influenced an entire generation of cafe racers. It wasn’t just a looker. Bred for racing, it dominated the mythical Isle of Man TT for years, and became a firm favorite for privateers. The 499cc single featured a Featherbed frame, made up to 54 bhp, and weighed a measly 310 pounds (140 kilos). But technology has moved on. And while you can still buy a classic Manx racer, you’d need to look elsewhere for equivalent performance by today’s standards. Which is exactly what Sacha Lakic—accomplished designer and founder of Blacktrack Motors—has done. 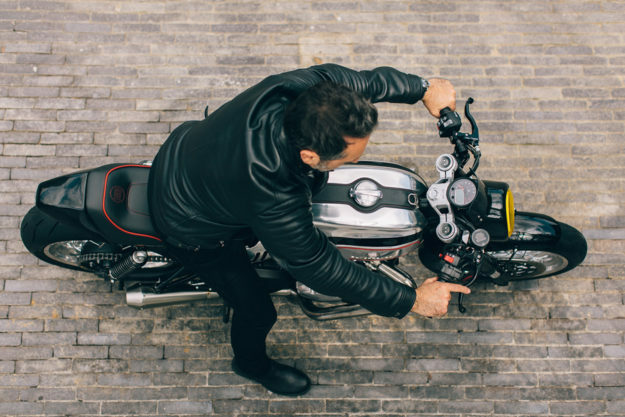 Blacktrack broke onto the scene last year with the BT-01, a limited production version of Sacha’s own CX500 cafe racer. For their second special, they set out to build a modern Manx. But first, they needed a suitable donor. Something modern and reliable, with performance to match the Manx’s legacy. 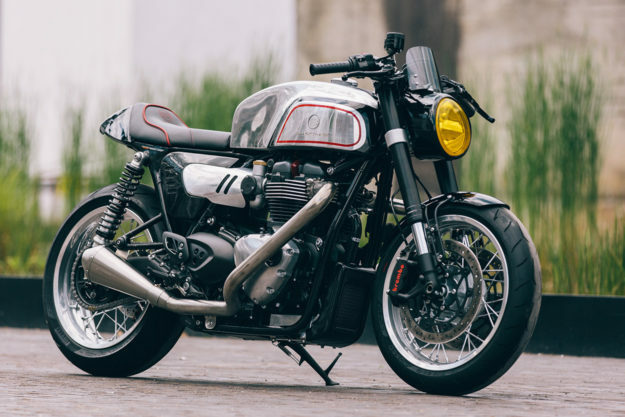 Enter Triumph’s new Thruxton R: an out-the-box cafe racer with an impressive parts spec, that’s been met with universal acclaim since its launch. 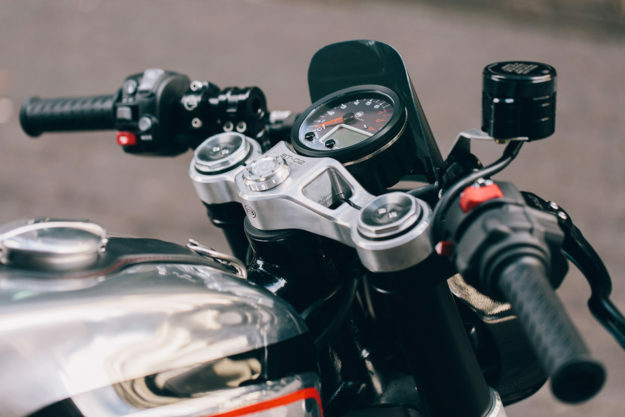 With 96 bhp and 112 Nm on tap, fully adjustable Öhlins and Showa suspension, and Brembo brakes all round, there’s not much to upgrade on the Thruxton R. So Blacktrack were free to focus all their energy on aesthetics. 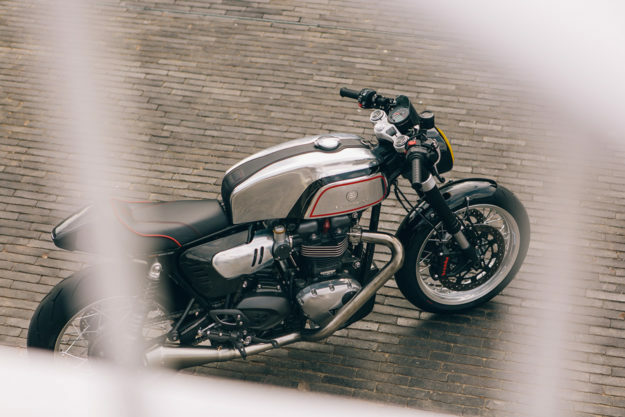 One of the Manx’s most recognizable features is its tank—so Blacktrack started by reinterpreting those unmistakable lines in a package that would complement the Thruxton’s build. With a design penned, Blacktrack partner Ludo Gaag shaped the final unit from aluminum. The same philosophy was applied to the one-off seat too, carrying through that classic Manx line. 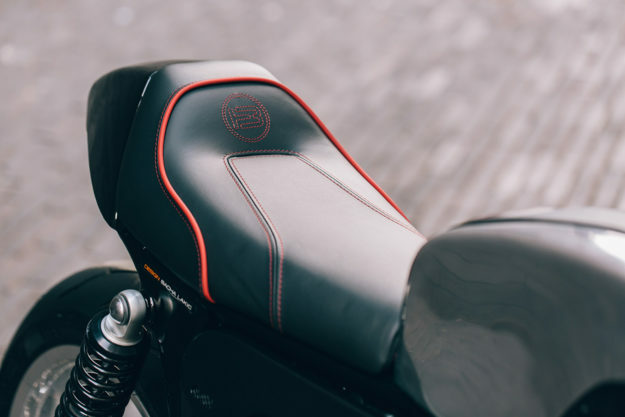 It’s been upholstered in full grain leather, with contrasting red stitching and piping. That effect continues up top with a custom-made tank strap, giving the bike an extra vintage hit. Other custom bits include new side covers, a new front fender, and a Manx-styled headlight and fly screen. 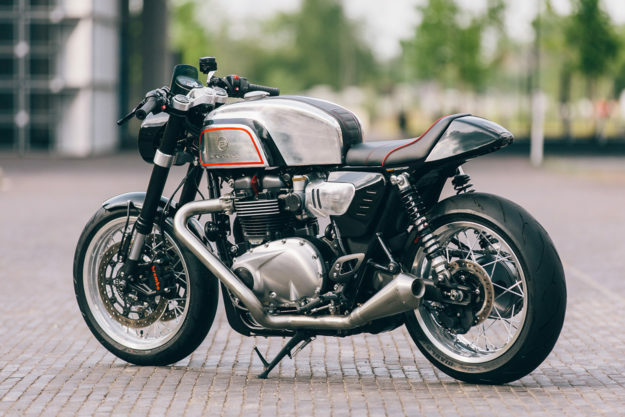 Sacha also designed gorgeous new triple clamps that fit the Thruxton without any mods, and a matching pair of clip-ons. The exhaust was another key piece. Blacktrack wanted to replicate the Manx’s sharply angled headers, and unmistakable sound. So they designed a whole new stainless steel system, terminating in a pair of Spark mufflers. 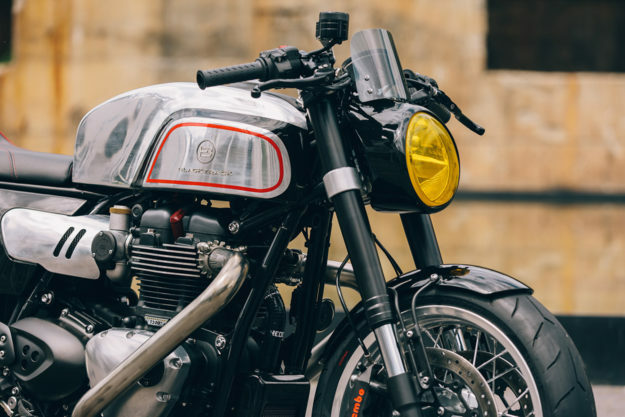 Sacha opted not to mess with the bike’s air box or fuel injection, but did lament the fact that the Manx was air-cooled—and the Thruxton has a massive radiator hanging off it. He also had a gap to contend with, where the old exhaust system’s catalytic convertor sat. So he designed a new radiator—one that would hold the same volume as the old one, but occupy the space better. It now sits low down and out of the way, with its cover shaped to act like an air intake, and a small—but powerful—fan just behind it. The speedo presented another challenge. The idea was to have a classic, round dial—but Triumph’s new gen electronics are almost impossible to bypass. Luckily Sacha had connected with the owner of Acewell, who was working on a workaround. When he heard about the project, he accelerated development, and provided Blacktrack with a fully functional prototype unit for the build. The only other major change was the rear suspension. There was nothing wrong with the stock Öhlins’ performance, but Blacktrack wanted the rear to sit lower for a less aggressive, more classic stance. So they fitted a set of shorter, custom-made Shock Factory units. With that done it was time for the easiest part of the project: settling on a livery. With Blacktrack’s own branding matching Norton’s black, red and silver color palette, there was no need for debate. Every part’s been given careful consideration, with matte and gloss black, and raw aluminum and anodized finishes throughout. Even the gold Showa fork legs have been blacked out, to keep things as cohesive as possible. 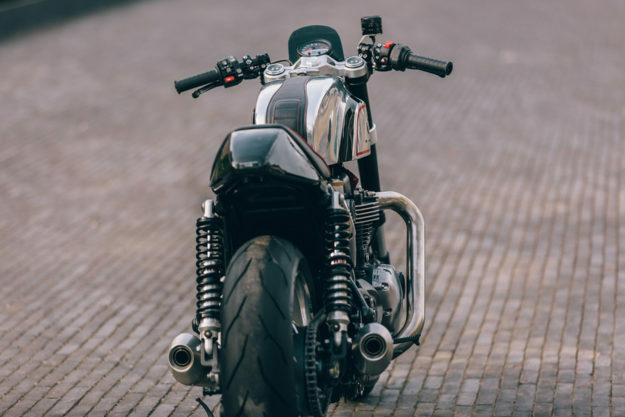 Blacktrack have called the BT-02 ‘Thruxman,’ as a homage to classic café racer naming conventions. 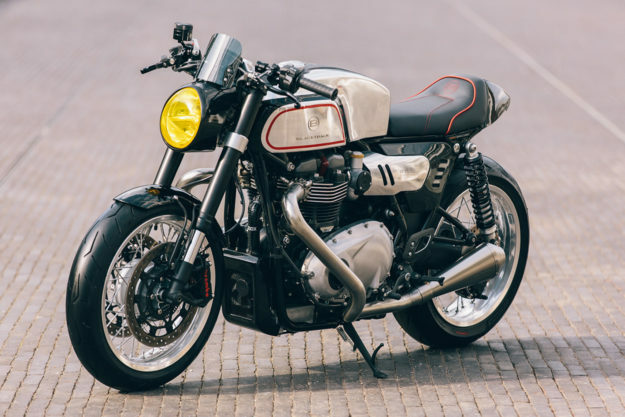 Where combining a Triumph engine and Norton frame would give you a ‘Triton,’ Blacktrack opted to combine model names—Thruxton and Manx—instead. 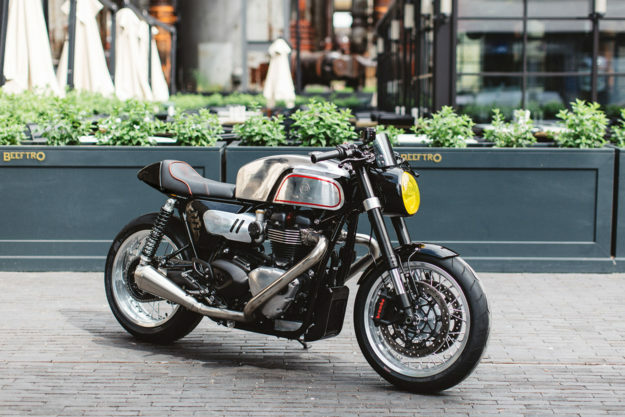 Best of all, everything you see here can be bolted on and off, without any modification to the Thruxton’s frame. So yes—Blacktrack are planning to reproduce these, but in extremely limited numbers and only upon special request. It’s a stunning tribute to a much-loved motorcycle—an intoxicating blend of modern performance and classic looks. Does Norton have Mr. Lakic’s number, we wonder?